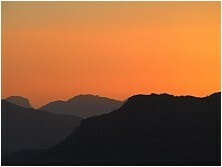 The history of Rooisand began in 1999, when a German business man knocked on my door. 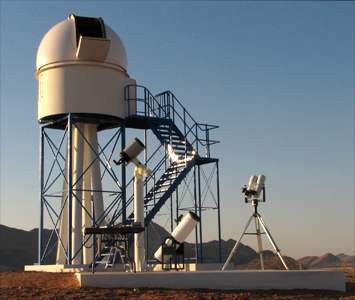 The connection had been made by Baader (a company in Mammendorf), and he told me that he bought a lodge in Namibia and wanted to build a private observatory. At that time I had, together with Ferdinand Schäfer and Doris Unbehaun, established two well-equipped huts with sliding roofs on Tivoli astrofarm. 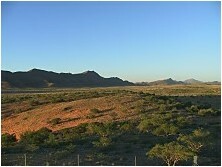 Rooisand is one of the typical Namibian guest farms, and is situated halfway between Windhoek and Swakopmund on route C 26 close to the Gamsberg pass. 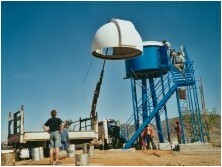 The Rooisand project started in 1999, when the owner asked me to plan and build an observatory for the farm. 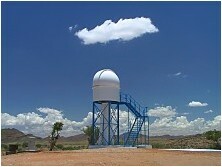 The planning was finished in 2000 and in 2001 the observatory was sent via container ship to Namibia. 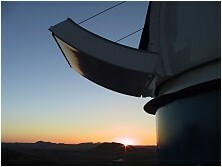 Because of difficult circumstances, the construction of the observatory was delayed until November of 2004 and finished by the end of 2004. 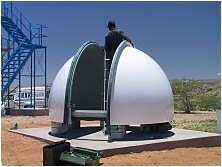 In May of 2005 small details were finished and starting in July of 2005 the observatory was also available for rent. 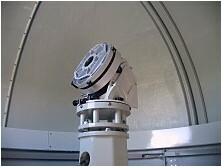 The telescope at Rooisand was in a 3.2 m Baader dome on a steel tower 8 m above the ground (this elevates the telescope above the air layers which are close to the ground). 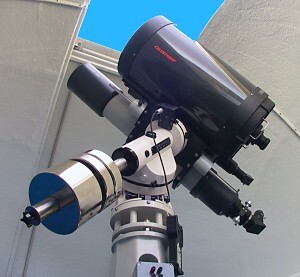 It consists of a Celestron 14 (selected for the high optical quality) and a Zeiss 150 mm APQ refractor as well as a Zeiss 80 mm refractor mounted in parallel. 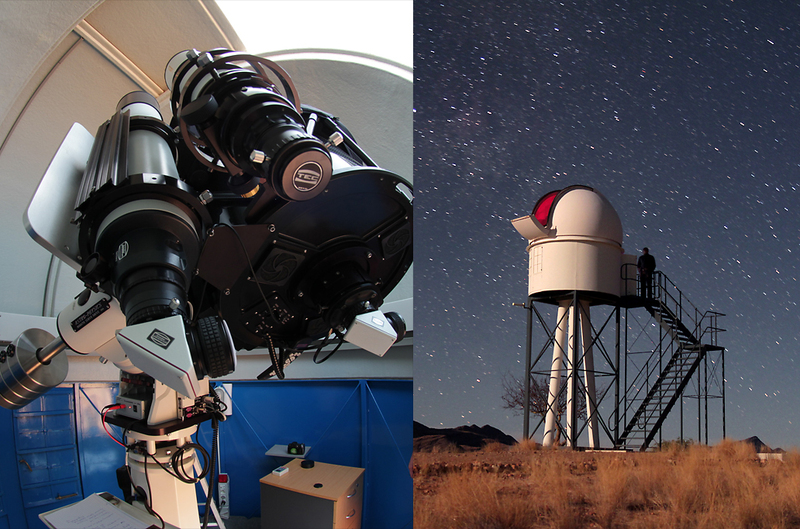 The whole combination is mounted on a Astro Physics GTO 1200 mount. 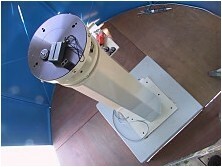 The whole telescope can be controlled by a computer. 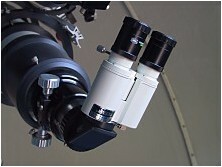 In addition to that there were several transportable telescopes, for example a 20 x 125 Vixen double glass and a Vixen Atlux mount which can be used to mount any of our telescopes. 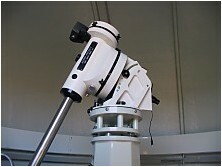 Furthermore, a 12" Dobson telescope and a C8 as well as extensive accessories such as adapters and zenith prism were available. 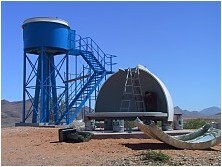 Below you can see several pictures of the construction of Rooisand observatory. 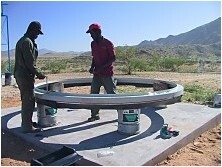 The dome segments Assembling the base ring Assembling the segments 40 degrees in the shadow! 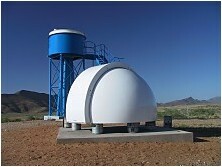 Between 2005 and 2007 difficulties in both the private and business relationship between Paech/Unbehaun and Tivoli astrofarm increased. 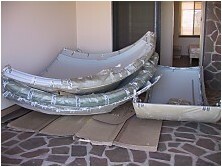 As F. Schäfer had died by then, both sliding roof huts - with part of the equipment - were sold to Tivoli. 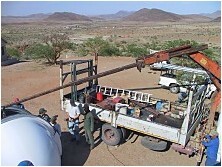 Our private instruments were brought to Rooisand and stored there. 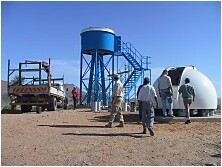 In 2010/2011 the owners of Rooisand desert ranch went bankrupt and the farm was sold. 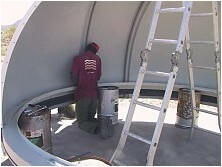 The telescopes with all accessories were "saved" and sold to Onjala lodge (through the contact of Mr. Paech), were in 2013 they were installed in a 4 m Scope Dome. 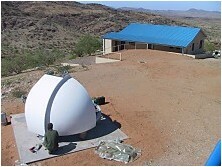 The dome remained on Rooisand lodge and was taken over by the new owner. 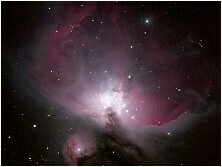 Between 2011 and 2013 it was equipped with a very old Vixen Atlux mount and a C11. 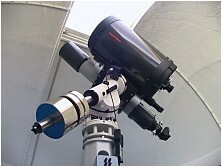 In 2012 the owner decided to install a modern telescope. Mr Paech was asked to do the planning, in the summer of 2013 the telescope was installed by W. Paech and F. Hofmann and is since then operational. On August 7th, 2013 the day had finally come. 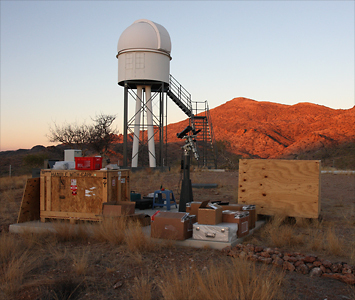 A nearly 750 kilogram Baader shipment was waiting for us in front of the Rooisand observatory dome. 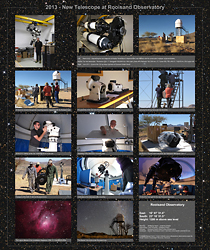 Please download the PDF file when you look at the individual pictures in order to get a list associating the pictures with the individual assembly steps. 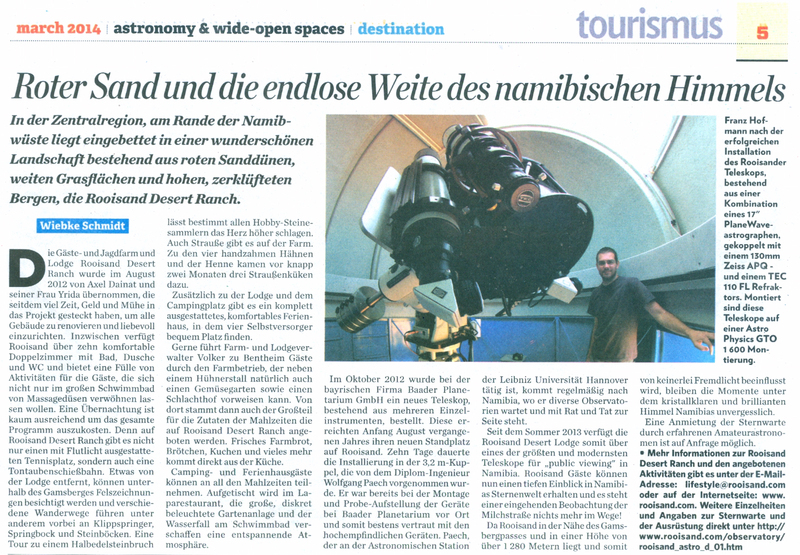 Rooisand covered by the Namibian press can be read here at the Namibian Tourism Board.